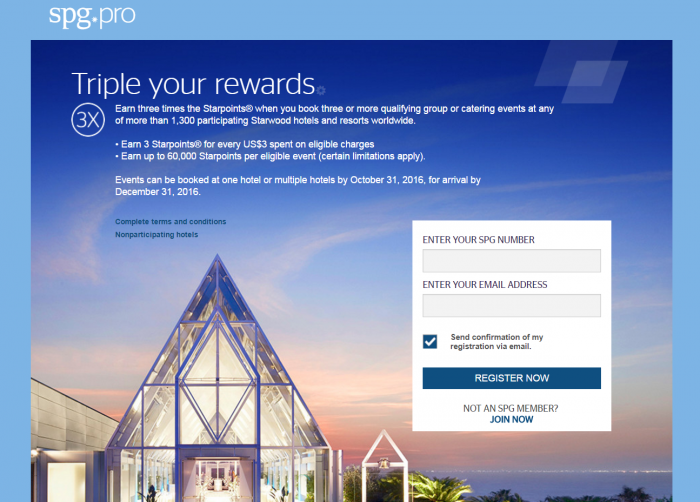 Starwood Preferred Guest (SPG) has a promotion for SPG Pro members that can earn triple Starpoints for meetings until the end of the 2016 that are booked by October 31. Members may earn up to 40,000 bonus Starpoints per eligible event (max 50 rooms per night). These meeting planner promotions among the chains are very common. Great way to try swaying business to specific program by throwing bonus points. If a member of the Starwood Preferred Guest® program (an “SPG® Member”) registers for this promotion and books three or more eligible meetings or events at one or more Participating Properties between March 7, 2016 and October 31, 2016, which have an arrival date on or before December 31, 2016, and have a maximum of 50 eligible guest rooms booked on the peak night (each, an “Eligible Event”, and collectively, the “Eligible Events”), the SPG Member will earn 2 bonus Starpoints® for every US$3 of eligible charges up to a maximum of 40,000 Starpoints per Eligible Event if he/she satisfies the terms and conditions of this promotion. The bonus Starpoints will be posted 4-6 weeks after three or more Eligible Events are held and paid for, and Eligible Events benefits are posted by the hotel. • Membership in the Starwood Preferred Guest (SPG) program may be obtained for free at spg.com. • “Peak Night” is defined as the contracted block date with the highest number of guest rooms. • Promotion must be referenced at start of the negotiation process with the Participating Property for the Eligible Event, and is not valid with any room blocks or Eligible Events booked under negotiation or that occurred prior to March 7, 2016. • Promotion may not be combined with any other offers, incentives, discounts or promotions with the exception of SPG Pro Double Double Promotion. Full terms for the SPG Double Double Promotion can be found at spg.com/double. • Promotion is subject to availability of guest rooms and meeting facilities at time of booking. • The Customer must be a legal corporate entity with a valid tax ID number, business number or other equivalent documentation. • The SPG Member must provide his/her SPG Member number in the Eligible Event Agreement or to the applicable Participating Property at the time of booking. • The SPG Program Terms apply to the SPG Member’s use of Starpoints awarded under this promotion. • If the Eligible Event is canceled, the Starpoint signing bonus may be removed from the SPG Member’s account. • Promotion is valid only at Participating Properties. • To the extent that terms are capitalized in these terms and conditions, the terms have the meanings specified in the SPG Program Terms. • Starwood is not responsible for omissions or typographical errors. • This promotion is void where prohibited by law. • Starwood reserves the right to discontinue this promotion at any time.